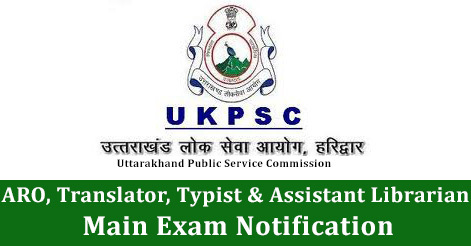 Uttarakhand Public Service Commission UKPSC has released examination schedule for the main exam of UKPSC Assistant Review Officer/ Translator/ Typist/ Assistant Librarian in Uttarakhand High Court. Examination will be on 04 July & 05 July 2016 at Haridwar. Candidates can check all details on the official website. The main written exam for Assistant Review Officer/ Translator/ Typist/ Assistant Librarian in Uttarakhand High Court will be held on 04 July & 05 July 2016. UKPSC has released important notice regarding the examination. Candidates can check all details on www.ukpsc.gov.in. Help us to improve this article/job posting "ARO, Translator, Typist & Assistant Librarian Main Exam Notification". We would be glad if you can comment below and provide your valuable suggestions and feedback. If this page have any wrong information/list or out of context content, then you can report us as well.